Students sometimes have difficulty understanding why they might want to reread a text. A simulation, part of an online professional development program from Annenberg Learner, clearly demonstrates how different purposes for reading result in attending to different words in the text. 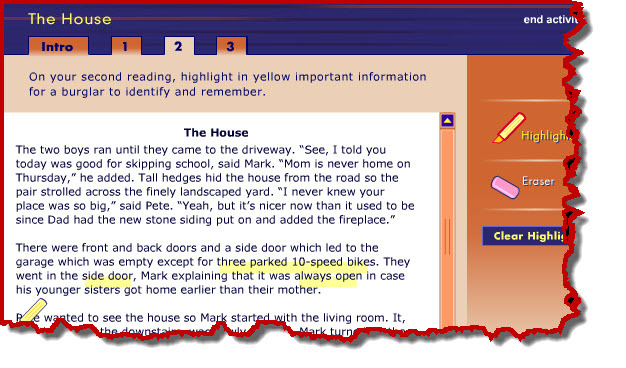 This simulation, titled “The House,” allows readers to interact with a short text by reading for three different purposes. Teachers may want to project this on a digital display for the whole class or allow students to work in pairs on a computer then discuss their how their highlighted text changes depending on the purpose for reading. Students come to see how highlighting a text can help them pay greater attention to what it says, as well. The digital highlighter and eraser tools are easy and fun to use. To try it, click here then choose “The House Interactive” link. This text is from a classic research study illustrating the dramatic effect that purpose has on what you pay attention to, and remember, when reading a text. I’ve used it before in my reading classes, but this interactive version will make the experience come alive! Thanks for sharing, DeVere!